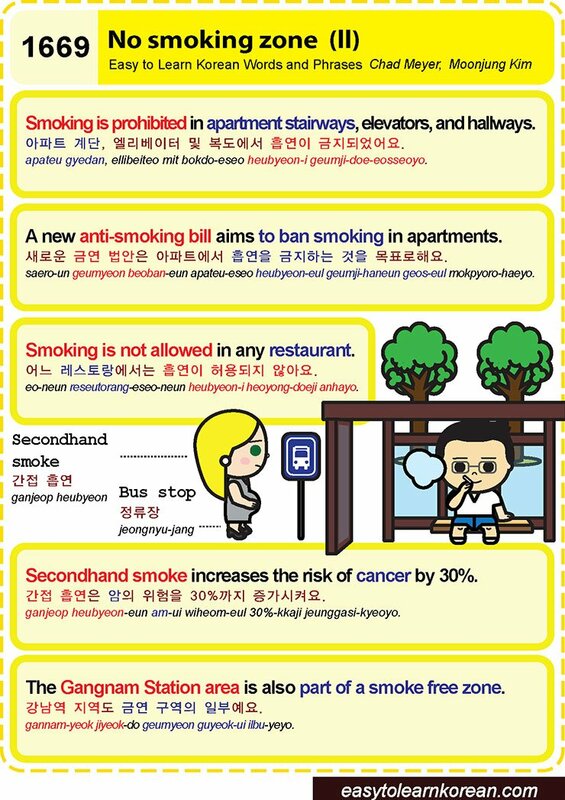 Easy to Learn Korean 1669 – No smoking zone (part two). Copyright © 2009-2019 Easy to Learn Korean and the Korea Times. The contents of this website, including all articles, illustrations, and any portion thereof, may not be reproduced, distributed, compiled, edited, reposted, or used in any manner without the express written permission of the author. This entry was posted in Series and tagged A new anti-smoking bill aims to ban smoking in apartments., and hallways., bus stop, elevators, secondhand smoke, Secondhand smoke increases the risk of cancer by 30%., Smoking is not allowed in any restaurant., Smoking is prohibited in apartment stairways, The Gangnam Station area is also part of a smoke free zone., 간접 흡연, 간접 흡연은 암의 위험을 30%까지 증가시켜요., 강남역 지역도 금연 구역의 일부예요., 새로운 금연 법안은 아파트에서 흡연을 금지하는 것을 목표로해요., 아파트 계단, 어느 레스토랑에서는 흡연이 허용되지 않아요., 엘리베이터 및 복도에서 흡연이 금지되었어요., 정류장 by easykorean. Bookmark the permalink.